Rudy Tambala appears courtesy of A.R. Kane. The Variety Club mix samples dialogue from the Pet Shop Boys' 1987 film It Couldn't Happen Here fact fiends. Gordon King and A.R. 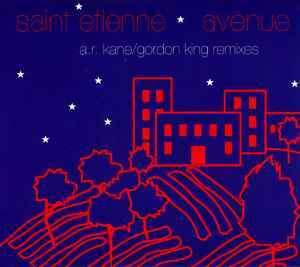 Kane get their hands on Saint Etienne’s shining moment, AVENUE. It's tough to improve on a classic, but the remixers try their best. Gordon King turns the “Variety Club Mix” into a piano-drenched space journey, while his “Butlins Mix” makes more use of the vocals. A.R. Kane, on the other hand, bring in a new bassline and jangling guitar for the “Martial Mix” and allows the “Venusian Mix” to mellow out completely. None of these, of course, can compare to the original, but it's not for a lack of trying.